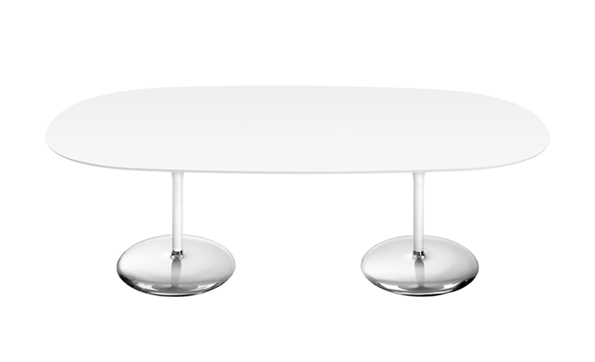 Table with double round pedestal base in shiny or brushed stainless steel. The column is available in white lacquered steel and the top is available in white embossed MDF or in laminate, with different sizes. Height cm 74 – 29 1/8″. Dimensions: MDF oval 300 x 131 (art. D092), MDF oval 250 x 121 (art. D093), laminate oval 300 x 124 (art. D099), laminate oval 250 x 121 (art. D072) cm. A compliment that extends beyond the collection, Duna tables offer a sturdy surface in circular, ovoid and square shapes that rest upon a sleek, steel base for use at home or office. Available in two heights (50, 74 cm – 29 1/8″, 19 5/8″) in round, oval and square tops of white MDF or laminate in a range of sizes. Base is available in shiny or satin-finish stainless steel with column in white lacquered steel. Large tops are also available with double bases suitable for conference room applications.